Jennifer holds a bachelor’s degree in Computer Science from UC Berkeley and a master’s degree in Education from UCLA. Before she became a full-time writer she held various jobs from bookselling to teaching inner-city children to playing bit roles in soap operas. 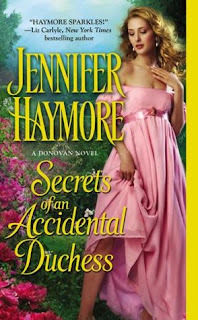 Lisarenee: What sparked the idea for the series The Donovan sisters and, more specifically, this book, 'Secrets of an Accidental Duchess'? BTW, I loved the first book and kept hoping there was someway Meg survived being thrown overboard. Jennifer: I’ve always loved writing about families, and the relationships between sisters has always intrigued me…but most of all, I’ve been enamored of twins for a long time. I used to dream that I had a twin somewhere in the world who was taken away at birth. So those interests/fascinations were the seeds for the series. As for SECRETS OF AN ACCIDENTAL DUCHESS, I first read about malaria and how it was treated in Diana Gabaldon’s Outlander books. I was intrigued by the disease that lay dormant inside its host, only to rear its ugly head at the most unexpected times. As for Meg…wait for PLEASURES OF A TEMPTED LADY. Don’t lose hope yet! Lisarenee: Now I can't wait for 'Pleasures of a Tempted Lady' to come out. If you could see one historical event or attend one social event from the past, what would you be willing to travel back in time to see or do? Would it be satisfy your own curiosity or to be able to write about in one of your books? Jennifer: Here’s my nerdy history geek coming out, but I’d like to go back and see what really happened to the Princes in the Tower. Did King Richard III really kill them? Or were those boys’ murders part of some grand conspiracy to besmirch Richard’s name in history? Lisarenee: Do you have any other books in the works, and if so, can you tell us a little bit about it/them and when we might see them in a book store near us? Jennifer: Book three of the Donovan Series, PLEASURES OF A TEMPTED LADY, releases in August. This is the final installment in the Donovan Series and shows the last of the five sisters finding their happily ever afters. It’s full of passion, adventure (pirates!) and…well, conspiracy theories. Lisarenee: Thanks so much Jennifer for taking the time to answer a few of my questions. Serena Donovan left London six years ago, her heart broken and her reputation ruined by devilishly handsome Jonathan Dane. Now, with her family's future in peril, she reluctantly agrees to return to England and assume her late twin's identity. The price? Marry a man she doesn't love and spend the rest of her days living a lie. Jonathan Dane, Earl of Stratford, has become an incorrigible rake, drinking, gambling-and trying to forget Serena Donovan. Yet the moment he's introduced to the prim and proper "Meg", he recognizes the sensual young woman who captured his heart. Haunted by his past mistakes, he refuses to lose Serena again. But convincing her to trust him is no easy task. Claiming his lost love means exposing the truth and destroying the life Serena has sacrificed everything to rebuild. With the future of all the Donovans at stake, and their undying passion capable of triggering yet another scandal, how much will Jonathan and Serena risk for a chance at true love? It was a reckless wager, and one Max couldn't resist: seduce the alluring Olivia or forfeit part of his fortune. Yet the wild, soon-to-be Duke never imagined he'd fall in love with this innocent beauty. Nor could he have guessed that a dangerously unpredictable rival would set out to destroy them both. Now, Max must beat a madman at his own twisted game-or forever lose the only woman to have ever won his heart. Captain William Langley knows the ocean well, but nothing could prepare him for what he discovers adrift on the cold Irish Sea. The tiny boat carries two passengers: a child--and Meg Donovan, Will's long-lost love. Meg's disappearance at sea eight years ago was a devastating blow. Now she's back, as beautiful as ever, and with secrets as deep as Will's own . . .
After years held captive by a cold-blooded pirate, Meg has finally escaped with little Jake, the boy she's come to love as if he were her own. But the pirate wants his revenge--and Meg must do whatever it takes to shield Jake from the madman. Determined not to lose Meg again, Will vows to protect them both, yet Meg can't risk putting the only man she's ever loved in danger. With the threat to her safety growing, and her passion for Will burning brighter every day, surrendering herself to Will might be a pleasure too tempting to resist . . .
Book descriptions came from the back of books and Amazon. I ended up being Serena. Which one are you? 1) One winner per person and household. 2) You must be a US resident and be 18 years of age or older. 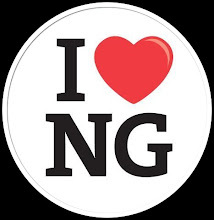 3) You need to be a follower of my blog or become one. 4) Leave a comment with a way for me to contact you to get your address (No P.O. Boxes) which I can forward to the publisher who will send you your books. It can be via email or Goodreads message or, if you feel uncomfortable with those two options, email me the information at seducedbyabook@gmail.com. Contest ends February 10th. Winners will be notified by email or Goodreads message and have 48 hours to respond from when the email/message was sent before another winner is chosen. Only one winner per person and per household. I like the rake, the bad boy that is so charming that no one can really be mad at him, but he eventually mends his wicked ways. I am interested in reading about the Donovan sisters and how they manage to find their true love through many twists and turns.